For me, the way into the appreciation of this painting is through the faces. Chancellor Rolin is on the left. 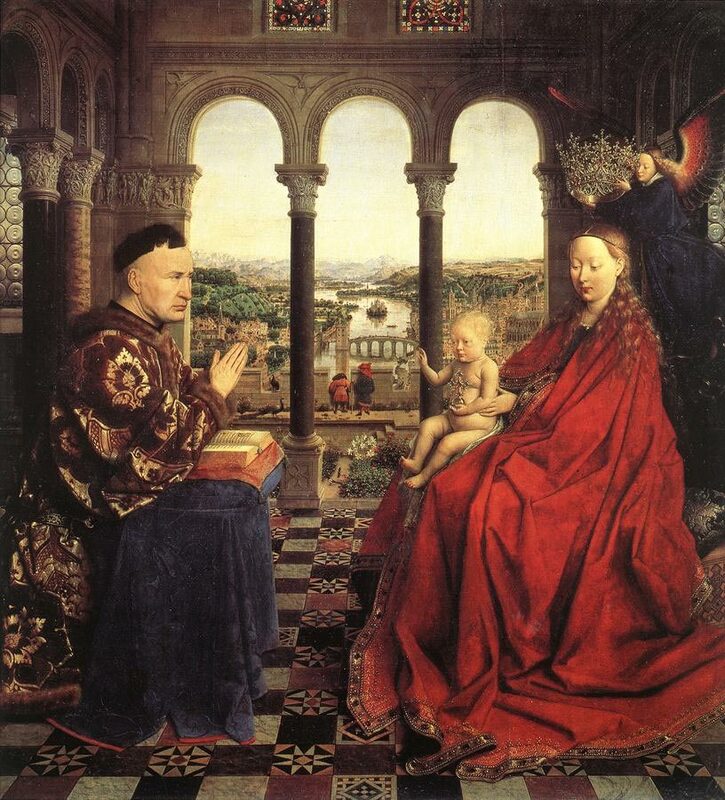 He’s the wealthy and influential minister who hired Jan Van Eyck to paint this. He’s gazing at the supernatural visitation on the right with a severe and attentive look. To me it feels as though the world of the holy and supernatural is part of his daily work and something he considers a very serious matter indeed. Mary seems to be looking at the cross on top of the globe [that the infant Jesus is holding], prefiguring her son’s suffering and crucifixion. Again, very serious. And the infant Jesus also has a serious look on his face. It appears that one can say intellectually that the painting is about the severity and seriousness of true Christian devotion. I’d like to suggest that this painting may also be about the seriousness of the search for beauty in life — something I’m not sure I ever felt before I saw this painting. I do feel there could be some insight here but not exactly as you state. The Chancellor seems to be finding that which he could condemn. Cannot say what since his line of sight seems to be the Christchild. I believe the Bible states that Mary say the future of Christ in that he would suffer. The blessings Christ wold give would come later when He was able think as a Man of God. The beauty of life is something we should take seriously and give thanks for. God gives us so much of it in this world with Hope of much more to come.